NASA will discuss plans for its next major telescope mission, a new satellite equipped to search for black holes, in a briefing Wednesday (May 30) that will be broadcast live online. NASA's Nuclear Spectroscopic Telescope Array (NuSTAR) instrument is set to launch June 13 from Kwajalein Atoll in the Marshall Islands. The telescope will be packed aboard an Orbital Sciences Pegasus XL rocket due to launch from a plane in midair. NASA officials and scientists involved in the project will preview the mission during a 1 p.m. EDT (1700 GMT) briefing set to air on NASA TV. 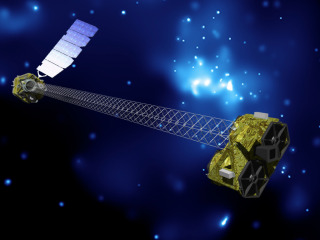 NuSTAR will image light in the high-energy, short-wavelength X-ray range with unprecedented sensitivity and clarity. The telescope will aim to study how black holes form and evolve along with galaxies. NuSTAR will also observe other cosmic mysteries, such as high-speed particle jets, ultra-dense neutron stars, supernova remnants and our own sun. The observatory was originally scheduled to launch in March, but NASA determined that more time was needed to review the rocket's software. Fiona Harrison, NuSTAR principal investigator at the California Institute of Technology in Pasadena, Calif. The press conference, which will take place at NASA headquarters in Washington, D.C., will be carried live on NASA TV as well as Ustream: http://www.ustream.tv/nasajpl2. Anyone can submit a question to be answered during the briefing via Twitter, using the hashtag #asknasa.